Carrie Underwood’s engagement ring has been causing a stir since we caught a first glimpse back in 2009 when hockey star Mike Fisher proposed. Featuring a gorgeous canary diamond in the five to six carat range at its center, it is embellished with a diamond halo plus pave diamonds along its shanks. The overall look is thoroughly modern, yet it gives a nod to vintage style – and it’s the perfect complement to Carrie’s striking blonde coloring. Like many love stories, the one Carrie and Mike share began innocently enough when friends set them up on a blind date following a 2008 concert. Because Carrie was understandably nervous about the whole concept of matchmaking, the two went on a group date with friends. They hit it off, dated for a year, and then embarked on an engagement that began with what has been described as an old-fashioned marriage proposal. The moment was a private one, and took place at Mike’s family home. Carrie Underwood’s engagement ring was unveiled a short time later. Like Carrie Underwood’s engagement ring, this one from Brilliance features a fancy colored diamond and has an appearance that can only be described as jaw-dropping. The platinum band and white accent diamonds set off the canary-colored stones perfectly; a white gold setting would accomplish the same goal. Born March 10, 1983, Carrie Underwood is famous for her rapid rise to stardom following the fourth season of American Idol back in 2005. Since then, the country music star and songwriter has enjoyed acting roles and other creative opportunities that showcase her sparkling personality. Music critics have described Carrie Underwood as Country Music’s Reigning Queen. Not only have many of her songs topped the charts, she holds the Guinness Book record for being the female country artist with the most number one hits on the Billboard “Hot Country Songs” chart. TIME Magazine has listed her as among the world’s 100 most influential people. Carrie Underwood is a true American success story; she rose to stardom from humble beginnings. Her father was a sawmill worker, her mother was an elementary school teacher, and she was raised on a farm in the rural Oklahoma town of Checotah. Her childhood was spent performing at talent shows, her local church, and popular local events. 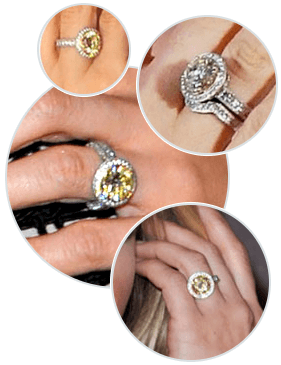 What Our Experts Have to Say about Carrie Underwood’s Engagement Ring. Carrie Underwood’s engagement ring is a great example of the many custom celebrity engagement rings that suit their wearers perfectly. The five-carat center stone is stunning, but its size doesn’t overpower Carrie’s delicate hand; instead, it complements her looks perfectly. The ring has been estimated to have cost about $150,000 USD, however some experts place its price tag closer to the one million dollar range. Designed by celebrity jewelry creator Johnathon Arndt, Carrie Underwood’s engagement ring is a little edgy, but its vintage look will never go out of style. Celebrity engagement rings are pricey, and many vintage engagement rings are as well. In the event your own budget isn’t quite able to keep pace, consider choosing a more affordable design from Brilliance, where you can use an easy online tool to start the process of creating your own custom engagement ring. By working with the jewelry experts at Brilliance, you can enjoy the exact look you long for while selecting a price that appeals to you. Whether you choose a canary diamond or another fancy colored stone to represent the love you share, you’ll love the way it looks.